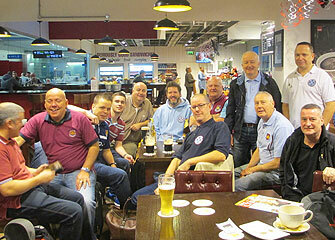 Following the terrific start to the season so far, 16 brave souls gathered in Dublin airport to head off and watch the Hammers take on Aston Villa. This fixture last year was so bad that both teams were deducted a point for bringing the game into disrepute! So it was great to see everyone in a more positive frame for the game. The early predictions were for us to win 3-1 with Sakho, just back from injury, to set a new record. 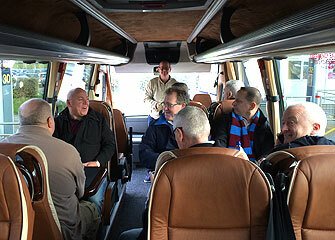 The flight to Stanstead was uneventful where we got a chance to compare notes with our new buddies from the Athlone Hammers who were on a day trip. Galway Eugene had been on the go from 2.30am that morning so grabbed some much needed shut eye. Hats off to Tom Jones with the luxury coach that picked us up from the airport and whisked us to the Premier Inn in Romford. The only downside was there was no microphone for Liam so we had to strain to hear him tell us the programme for the weekend – any of you that know Liam will understand that he always talks in hushed tones, except when you owe him €10 for the trip! Hats back on for Tom Jones when we arrived at the Premier Inn Reception!! It was a portacabin in the car park which had us worried about the “standard” of our accommodation. As it transpired there was no need to worry. 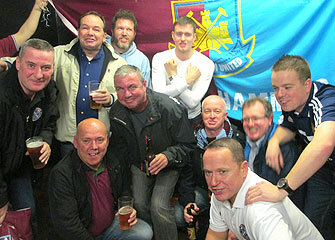 They are adding more rooms to the hotel to accommodate the growing numbers of Dublin Hammers supporters. 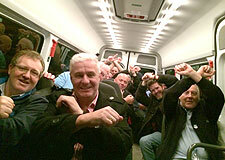 It was then time for taxis to the ground to see if we could get Sir Trevor to sign books for us. When we got there the queue was a mile long so we decided instead to head for breakfast. Both Eddie Cox’s, Timmy and myself went to Kens Café for their heart attack special (vegetarian option for Timmy). As we waited for our food one of the Eddie’s got agitated at the delay in service so we had to calm him down, explaining that the chef was a professional who took great pride in the presentation of the large breakfast. Fed well we headed to M&Ms for refreshments and a catch up with a few old friends. 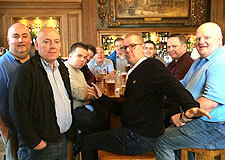 There was a great atmosphere in the pub with everyone looking forward to a good performance and a good result. 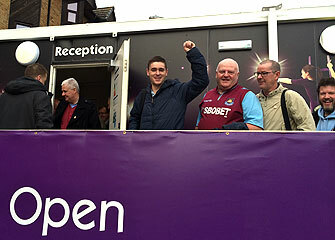 The atmosphere in Upton Park was so different to the same fixture last year. With the Hammers playing well the crowd were right behind them. The game lived up to it’s expectations in being a very entertaining affair but without our predicted scoreline. Our thanks go to Sky Sports for getting Agbonlahor hooked on the GAA this year as when he was clean through on goal he decided to take his points. I think Keano explained to him at half time that points don’t count in soccer. Anyway we had a number of chances to win the game with Sakho, Downing, Jenkinson and Carroll going close but Guzan in goal for Villa was outstanding. The game finished with us all on our feet urging the team to grab a late winner as we bombarded their goal and screaming about the two penalty decisions we didn’t get. It was back to M&Ms where we stayed for a few refreshments before heading back to Romford. Note to everyone – make sure you have the post code for your destination as unlike the Eddie’s, Dave’s, Mark’s etc who drive cabs in Dublin, the Barking mini cabs lads would get lost in their own back garden!! We all headed out into Romford centre that night, after one of the Eddie’s finally ironed his shirt (was this a bloke’s trip I was on???). Had a few nice quiet bevvies in the Golden Lion before heading to Yates where they have a bit of a nightclub. The doormen wanted ID from us and we were unsure if there was an upper age limit to get in. It turns out that for security reasons they look for ID from everyone regardless of their age. The place was hopping and in no time the Dublin Hammers were giving it socks on the dancefloor with both Liam and Eddie showing the younger folk that the hips don’t lie! Within minutes we had a whole load of ladies around us – apparently Essex men don’t dance for fear of ruining their hair and false tans (that’s what the girls told me anyway!!). The night ended, we were last out – as usual and all headed home for a decent night’s sleep. The following morning it was breakfast as usual – some decided to eat in the hotel while a few of us headed to Weatherspoons. 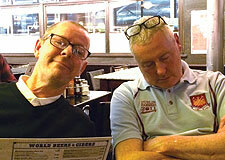 After the feast we headed to London central for the usual cultural tour of famous London pubs. We have noted that some of our old haunts are now gone (the Aldgate Exchange) and Shoreditch and district has now become a yuppie haven – overpriced drink and skinny lattes! Tom Jones, as (non-travelling) Travel Secretary will have to look into this as we prefer the old traditional style London boozer that reminds us of Eastenders. Anyway, we ended as usual in The George where we had a few as we waited for our (not as luxurious) bus back to Stanstead. The KFC was horsed down as we increased our calorie count intake for the day before arriving at the airport. Now apparently I was responsible for keeping everyone awake on the flight with my snoring but I have absolutely no recollection of this happening! The verdict? It was a fantastic trip, the game was scoreless but very entertaining (unlike last year), Romford has an abundance of bars for night time and is handy for trains etc to and from the centre of London and Upton Park, plus and it’s a big plus there is a big WHU store in Romford so you can get what you want on Sunday and leave it with your bag in the hotel, so no carting bags around all day.